November 4, 2013: D:O Goes Long III: Bigger and Longer-er. Essenden Airport How Low Can You Go? the power rangers face their anguish! o tempura! o mores! How do we get these stupid helmets off?! I imagine the one on the right is thinking, "Oh, I forgot my keys." congrats, jeff & jeff, and thanks, john!! Hullo, listener james, and thanks! Greetings from the Genius Bar at the Apple store. Always a deeply creepy yet satisfying experience. Hey, duke! I had that same notion, too, re the helmets. Either that, or the actors have just been told that Power Rangers have been picked up for another season. How-do, Doug! See if you can blast this gamelan-inspired tune up in there. Should chill everyone out nicely. Was anyone listening right before the show started? Curious if the vocals were audible on that VU cut that led into the intro theme. i do believe they were. Loving this Pelt Part Wild Gate. "The Dead C's Michael Morley in solo form as Gate, the UK's mysterio, coulda-been-an-ESP-Disk'-band Part Wild Horses Mane on Both Sides, and America's drone gods Pelt join together for an album of gamelan music. The MIE label presents the music beautifully as a limited, vinyl and digital release available everywhere November 25th." Home again home again, dancing a jig. Is this a music for long attention spans day? Would just like to note in print that D:O Radio made it's silent fundraiser goal thanks to the last-minute largess of LISTENER JONATHAN R. IN BROOKLYN, NY, who came through with a whopping, swag-earning pledge to put us over the top. THANK YOU SO MUCH, JONATHAN! @Captain Hate: it is indeed! Hi Jeff! I assume you are at home, and not in studio C (where I am) as the sign-up indicates? Uh, whoops. That is correct! Mis-signed up -- we'll be there next Mon. It's no problem! Sorry to blow your cover. Just curious how you could sound so good on the stream while invisible. I suppose a better answer, Amanda, would've been I'M RIGHT BEHIND YOU. sounding lovely at the end of the 1st hour! YAY. Glad you're still there, listener james! And now Wasp Club, oh crap they have got in the helmets again! One thing we do like to do here: play songs on the radio that really wouldn't end up on the radio any other way. Could be WFMU's motto, I suppose! who else would have me? Ha, Brian! Is there nothing that those gents can't be applied to? Welcome. James vegetable curry and basmati rice, come on over. @ljfw: well, judging by the heart to the right of your nom de radio, most anyone would be happy to have you! Oh, and it's leftover massaman beef curry here. Jeff they covered most bases, basely. For the record, leftovers via plus.google.com... Not the home kitchen. brian in UK, that sounds excellent. i will ready the hovercraft. James have you tried the new Hoovercraft it cleans as transports and glides smoother than warm butter on a nuns thigh. You are signed up for Studio C next week. Not sure whappen with that sign-up for today. Maybe you originally were going to come in to the station today? Probably my screw-up. Thanks, Doug. And naw, that was almost surely my mess-up. Ok, so...favorite Bond villains, by actor? Hard to go wrong with Christopher Lee, though I always had a soft spot for Lotte Lenya. Mr. Wint & Mr. Kidd were also delightfully creepy. Least fave perf would have to be Christopher Walken's. i wish we'd gotten more of jacob weisman onscreen as dr. no. my personal fave is gert frobe. he had verve. whoo hoo! I just got swag in the mail! SWAG MAIL = the best kind of mail! Was my missing Doug Wieselman LP in there by any chance, duke? Greetings and salutations, Uncle Michael! I've always thought that DW should do a solo clarinet record covering Mothers of Invention tracks. He would call it "Wieselman Ripped My Flesh." Good night everybody. You've been great. The Power Rangers are saying "Oh, MAN!...I was totally going to guess ABBA" and "I know...RIGHT?!" @jeff, no, but if it shows up, I'll let you know. Your album is probably with my Howlin' Wolf albums that my dead-beat friend walked off with. @Doug: before you go: www.menspulpmags.com... Very recently happened upon this post re WEASELS RIPPED MY FLESH and men's pulp mags etc etc. True story. They just don't make magazines like they used to. Am I the only one experiencing dead air? Hm...I can get it via the app, Cap'n....try a pause/play? Begging your pardon, we're going long today. Glad you made it back, Captain, and we feel your pain re the keypad. Wow, that IS a wild cover. I think the rainbow (such as it is) weirds me out the most. 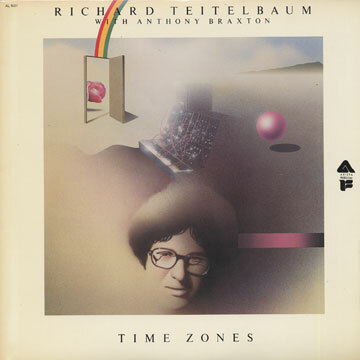 Teitelbaum surely got this record out via Braxton, who had a major deal with Arista at the time. They had a "403 - Forbidden" cover in 1977? Wow! Ah yes, there's the non-forbidden classic! I have to go bend some spoons for Dr. Dali. Thanks Jeff, this one works. You just had to work that GIF into your show someway, didn't you? excellent show, jeff & jeff; thanks for going long (and for going long!). Thanks for the Now Sounds for Today's Teens, Jeff! Thank ye thank ye: fred; duke; ljfw; Doug; and Uncle Michael!